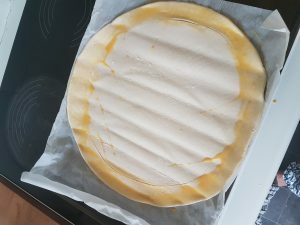 After discovering ready-roll gluten free puff pastry, I have definitely been more active in using this type of pastry in my recipes. I’m not a huge pastry fan generally and always found it such an effort to roll out the block puff pastry that I rarely bothered. However, I have now made a couple of gluten free puff pastry tarts that I have loved eating and my opinion on pastry may be on the turn. 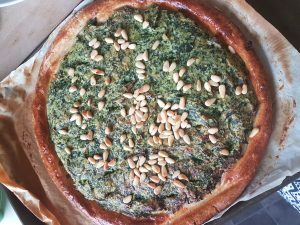 This leek, spinach and ricotta gluten free puff pastry tart melds some wonderful ingredients to create a comforting but impressive dish. 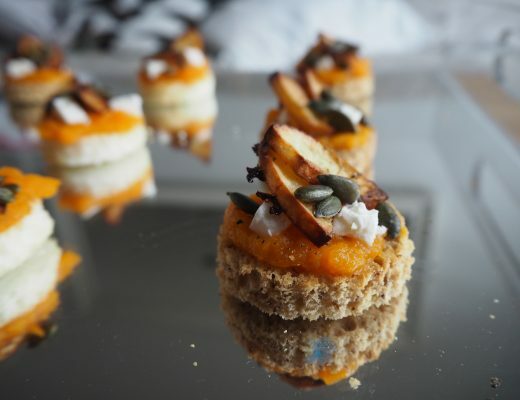 Roll out your gluten free puff pastry and lightly score the top approximately 1 inch from the edge all the way round. This will become the crust. Beat an egg and use a pastry brush or piece of kitchen towel to lightly egg wash the crust. Egg washing helps to ensuring a beautiful golden, shiny finish on the pastry once baked. In a small saucepan, add the knob of butter then cook your leeks over a low heat until soft and sweet. Add the frozen spinach and allow it to cook down. Once cooked, drain off any excess liquid from the spinach using a sieve and some kitchen paper to absorb the juice (give the spinach a squeeze). Then tip the spinach and leek mixture into a bowl. Add the ricotta, parmesan, a grating of nutmeg and some fresh black pepper to the bowl. Stir to combine. 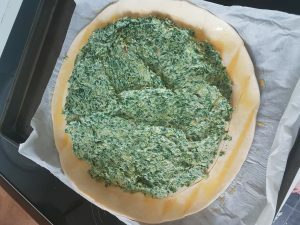 This is your tart topping, which should now be spread out evenly on the puff pastry base, leaving the crusts uncovered (as pictured). 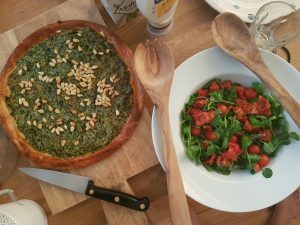 Next, sprinkle the pine nuts over the top of the spinach mix and then bake the tart in the oven per the packet instructions (usually 200C, 15 minutes). It should come out beautifully golden and crisp at the edges. Either serve straightaway with a tomato salad or allow to cool and eat as part of a picnic. 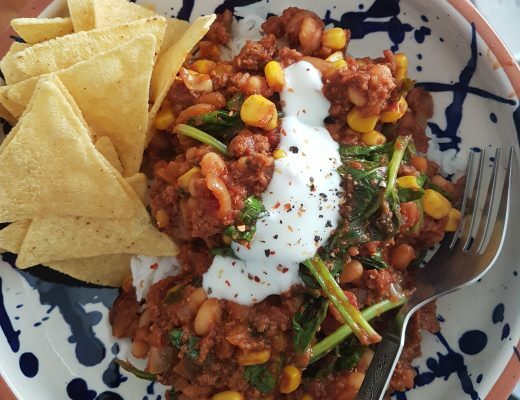 This dish is lovely either way and makes for wonderful lunchtime leftovers!